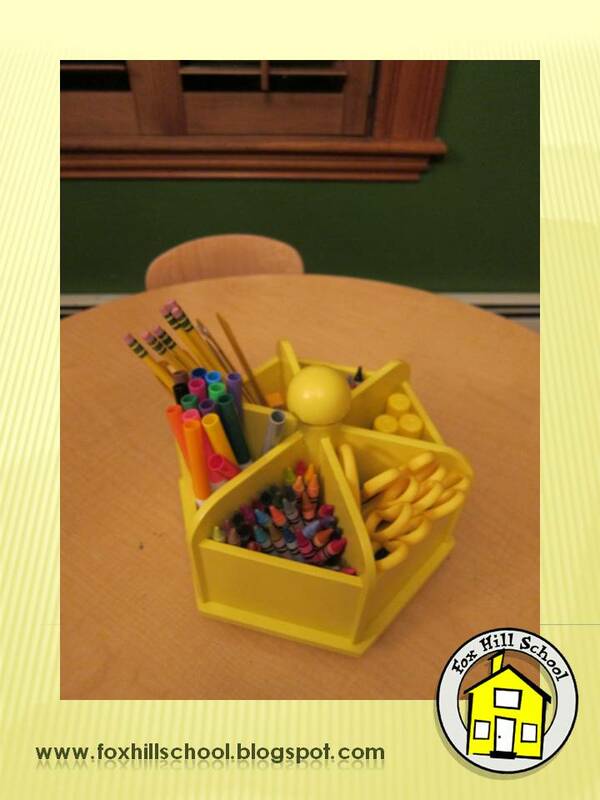 Another support book for our LMNO Peas curriculum is Color Farm by Lois Ehlert. It is a fun way to explore both shapes and colors! We were able to use this support book as inspiration for working on our fine motor skills, as well as color and shape identification skills. 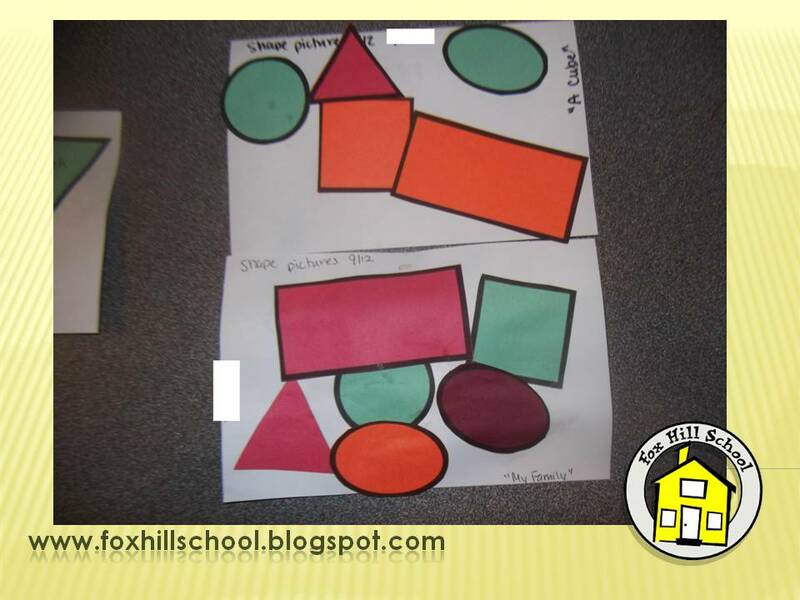 Lois Ehlert uses colorful shapes to build farm animals. Many of our K-Readiness students sat alongside one of the teachers to help cut out shapes printed on colorful construction paper: hearts, triangles, circles, rectangles, squares! Later that morning when we broke out into our activity time, we used glue sticks and these shapes to create our own "color farm" collage! As part of our LMNO Peas curriculum unit, one of our support books was Chicka, Chicka, Boom, Boom. We came up with a project that would encourage language and fine motor skills in addition to being a super fun art project! We used little wooden letters, craft sticks and tempera paints and we created ABC trees similar to the trees in Chicka Chicka Boom Boom! This project took a couple of days. First, in the woodworking area, the kids painted the wooden letters all different colors. Then they glued the craft sticks to white paper and, using foam paintbrushes, they painted green "leaves" on top of the craft sticks. 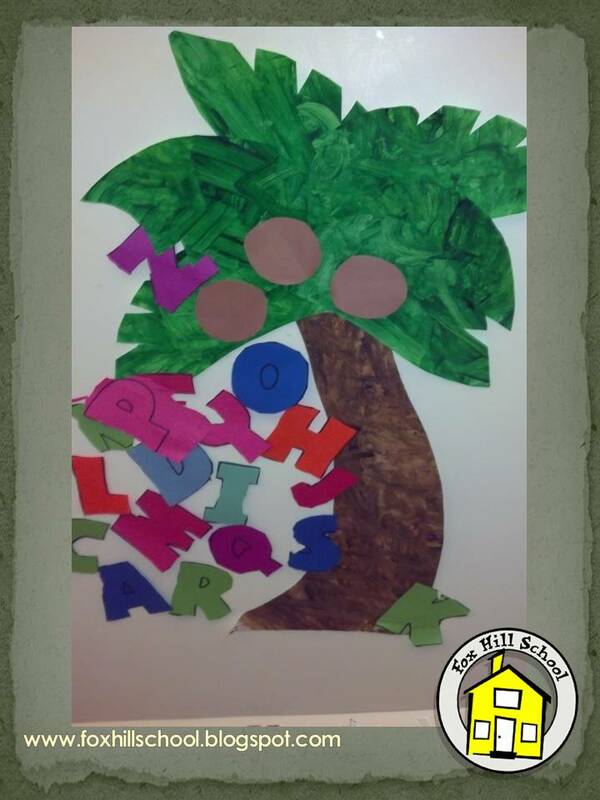 After the letters and trees were dry, the kids glued the letters onto the tree making an ABC TREE! 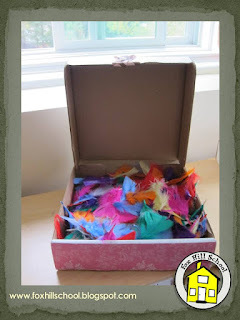 This project promoted creativity and focus and also strengthened fine motor skills! The sunflower fort was more than we could have imagined! 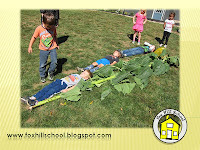 It grew very tall and the sunflowers all bent over to form an arch for the kids to play under! 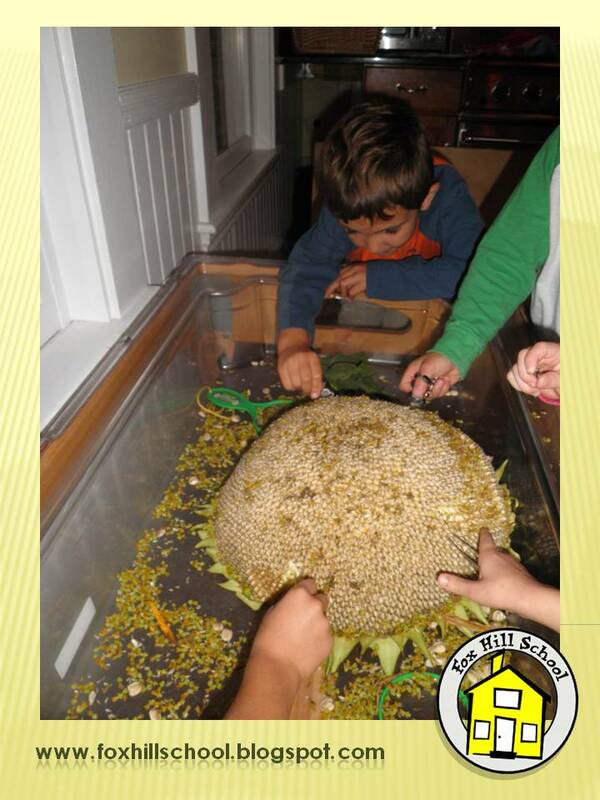 In art and science classes at the Kindergarten I planned a lesson to incorporate our sunflower fort. Since all of our curriculum is based on children's literature, first we read Sunflower House by Eve Bunting. 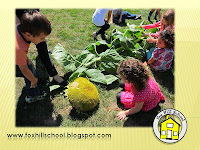 After listening to the story of how the children played in their sunflower house, we went outside to play in ours! 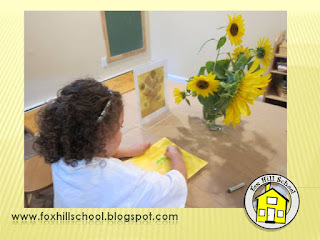 We picked some sunflowers and brought them in for art class. I had printed a photo of Vincent Van Gogh's Sunflower painting ahead of time and we learned a little about still life painting. The children used water colors and oil pastels and created their own amazing still life paintings of the sunflowers from our garden. Then we took the sunflowers and placed them in our science area so we could observe what would happen to them now that we picked them. 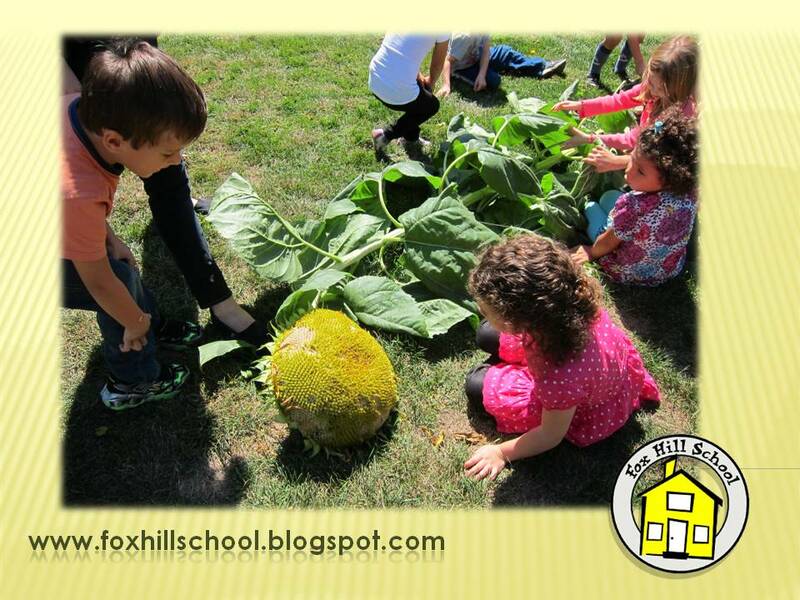 We also picked one of the Mammoth Sunflowers. First we measured it, not in inches or feet, but in kids! This week put the huge face of the sunflower in our sensory table! We exercised our fine motor muscles in our fingers and used strawberry hullers and tweezers to pick the seeds out of the flower. Wooden Supply Caddies - A Great Find! When we were planning for our new Fox Hill School Kindergarten program last year, we purchased the colored plastic caddies for each table to hold supplies. The caddies held crayons, scissors and glue sticks then we had coordinating narrow container on the table for pencils and erasers. This system worked OK, but things weren't always returned to their proper place. This year we stumbled upon beautiful wooden caddies from Pottery Barn Kids. We try to have as little plastic in our school as possible so this fit in with our environment very nicely. Although they cost a bit more than the plastic caddies, they will last much longer and the kids are better able to put things back where they belong. We purchased matching scissors for each caddie so it is even easier for them to know where everything goes (red scissors in the red caddie, yellow scissors in the yellow caddie, etc.) Bordering on crazy, I know, but we love being organized! They also take up less space on the table so we love them! 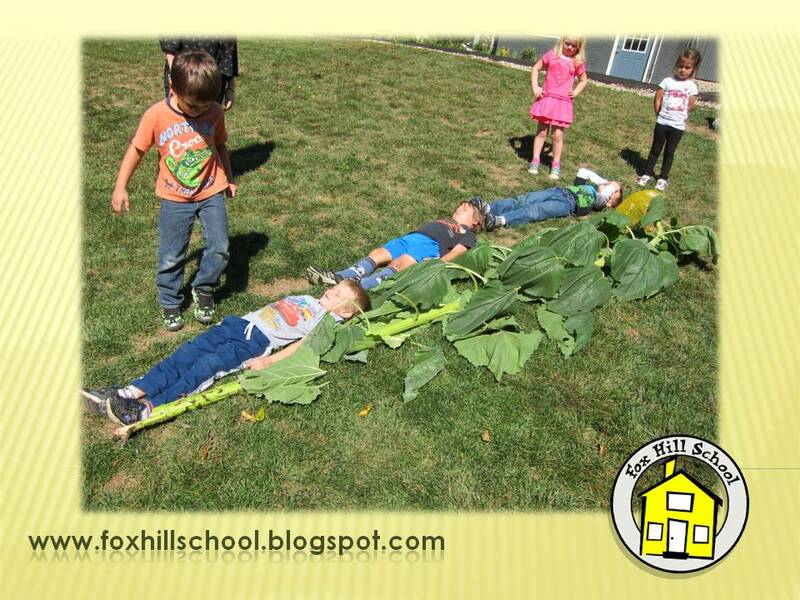 In addition to teaching one day per week and the Fox Hill School and my usual administrative duties running both programs, I also get to teach Art and Science at the PreK/Kindergarten program this year. I am very excited about this so I have been trying to get all our art materials in order and easily accessible. We have a small closet in the art room to store materials as well as an art trolley we purchased from Community Playthings (which I love!). The trolley holds all kids of materials that we want to have accessible to the kids at all times, but we have just as many things that don't need to be out all the time. I found the art closet a little unruly last year because of all the art materials that are not uniform in shape such as feathers, craft sticks, wood pieces pipe cleaners etc. These things always seemed to be floating around in the closet and never where I needed them when I needed them. I had save a bunch of boxes last year that our garden stone kits came in. They are a similar shape to a small pizza box. I had tucked them away and never thought of anything to use them for. I hate to throw things away - one of my weaknesses - so I kept them anyway! 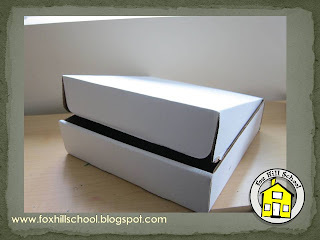 This summer when I was reorganizing the art closet I saw the boxes and it came to me! I could use these to store all the weird shaped art materials! So I glued scrap booking paper to the fronts of the boxes to make them look a little cuter. They are kind of hard to open so I also stapled a ribbon to the front flap so it is easy to open. Since this photo I have since labeled each box with its contents, but now they all stack nicely on a small shelf in the art room. They are easily accessible to me, but not out in the open for the kids to access. These could easily be reproduced using pizza boxes if you have an in with one of your local pizza places who would give you some clean ones! Displaying children's artwork in our class is serious business! We want their artwork to be displayed in a way that shows we respect their work and that we acknowledge the effort they put into it. We also want to reinforce their learning when they revisit their work displayed in the classroom. 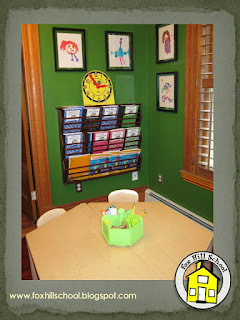 At a minimum, we try to mount all artwork on construction paper or something that resembles a frame. We have some actual frames up in the school in which we rotate children's artwork. 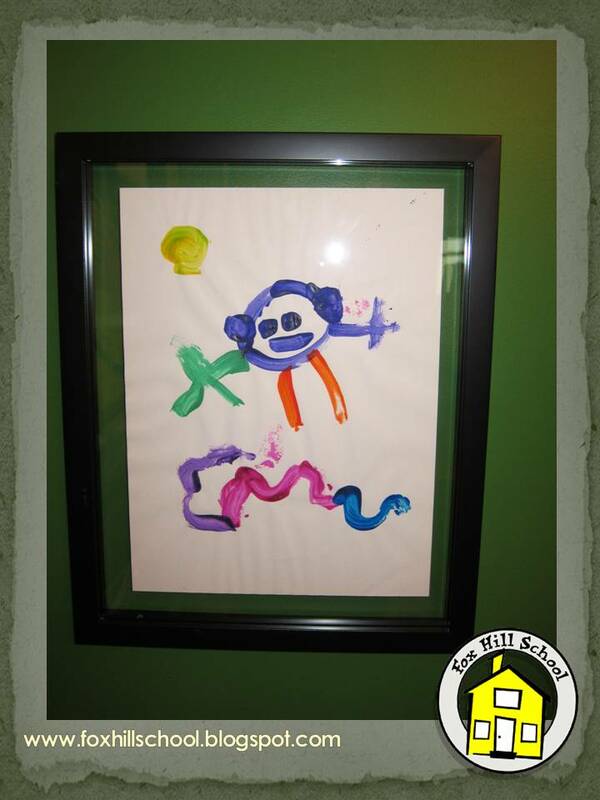 Kids love to see their work framed! 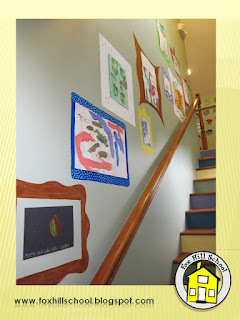 We have a long stairway in our school that is a great place to display children's artwork, but the frames were getting knocked as people moved up and down the stairwell. My kids went to art camp this summer and I saw a great idea at the art studio that we now have in our stairway. Ms. Amy, our resident artist, painted fancy, whimsical frames directly onto the walls of the stairway that fit the many sizes of paper we use at the school. Now when we display the children's artwork each masterpiece has it's own fancy frame! We recently read Chicka Chicka Boom Boom as one of our support books to our first curriculum unit of the year. We used our eyes to see the pictures, our ears to hear the story and our noses and fingers to touch and smell coconuts! One of the fine motor/sensory activities we provided was coconut scented playdough. The kids were able to try and make their own coconuts (that actually smelled like coconuts!) just like in the story! You can get a free download of our recipe for coconut playdough at Teachers Pay Teachers . 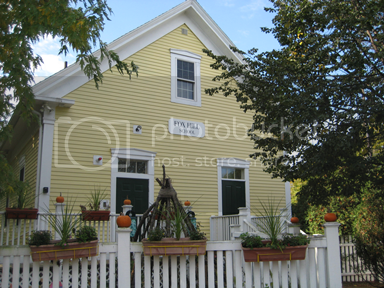 No Space for Children's Mailboxes? Think Again! How many times have you dreamed of having more space in your classroom? One trick we used to free up floor space was to eliminate big and boxy mailbox units for our children. 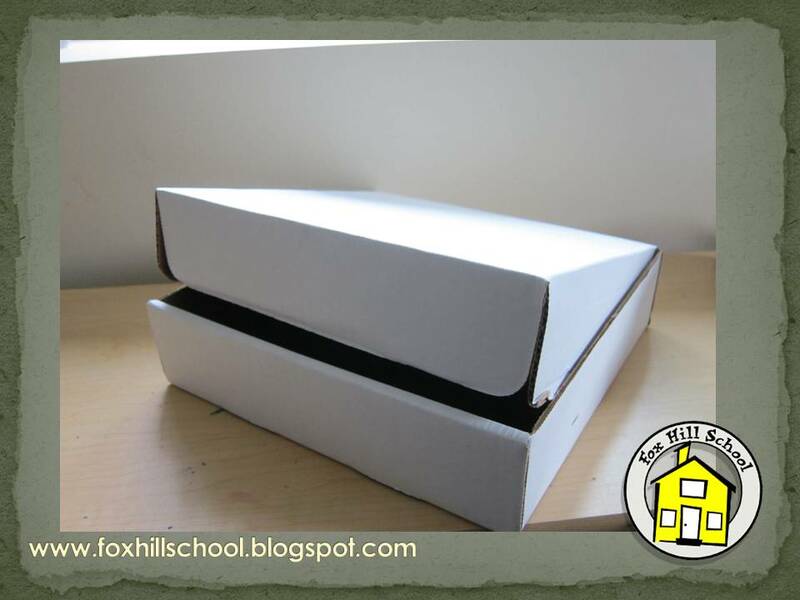 A quick and easy way to make your own mailboxes is to use over-the-door shoe organizers. Typically these are manufactured with 24 pouches. In our room we needed 28 mailboxes. The solution was simple. We purchased 2 shoe organizers, left one as is, and cut one row of pockets vertically off the other. Carefully we fastened the extra row using a hot glue gun. Finally we used printed headshots of the children and attached them to the pockets with clear packing tape. To eliminate the large metal hooks hanging over the top of the door, we stuck 3M hooks UPSIDE DOWN on the middle of the outside door, and threaded a fun fabric ribbon through the eyelets at the top of the organizer. Finally we took the ribbon and hooked it onto the upside down hook! In the past we have labeled the mailboxes alphabetically. This posed a problem for many of our 3 year olds who were unable to reach their mailbox. This year we decided to label mailboxes according to the height of the child. 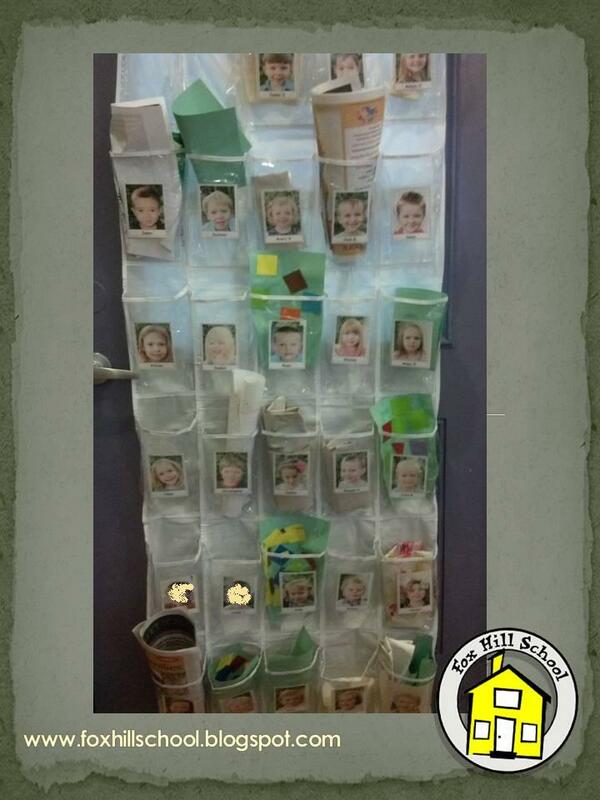 The tallest children will find their mailbox on the top rows, and the shortest children on the bottom rows. We learn in school that parent communication is crucial for building trust with parents but I didn't realize how crucial until my own child went to a daycare (before he was old enough to come to my preschool). The teachers were great and I knew they were taking good care of him, but most days when I picked him up and asked how his day was they said "He had a great day!" Although comforting to know that he was happy while I was gone, I never really felt I knew what he did while he was away from me at day care. I wanted to make sure that parents at our school had a good understanding of what their kids did while they were at school and that they felt they were a part of their preschool experience. I feel that our relationships with parents are just as important as the relationships we have with their children, so I go a little overboard with parent communication. It will take me awhile to cover all our means of parent communication but as the school year is about to begin, I will start with how we introduce parents to our program. 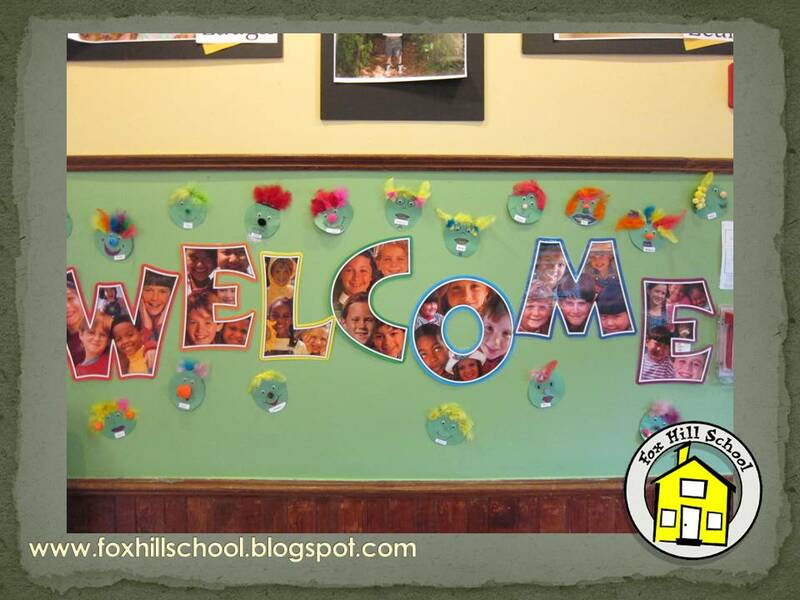 In the spring of each year we hold a Parent Orientation for new and existing families at the Fox Hill School. This is an evening when parents come to the school to meet other parents, talk with teachers, and learn about what to expect in the upcoming school year. We usually design the evening so that parents get to try their hand at some of the activities that their children have done or will be doing at school. Over the years we have had the parents make "playdough for one", they have planted painted clay pots and planted "grassheads", and they have had contests to see who could create the best likeness to the Eiffel tower with building straws or the tallest structure out of paper cups! 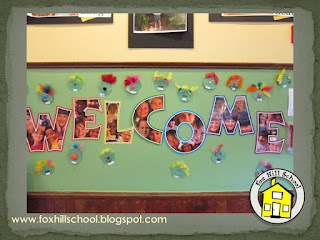 Click here to see a montage of one of our Parent Orientations: Fox Hill School Parent Orientation Montage. By the way, One True Media is a website we use often for our communications with parents. You can create a free account, upload photos and easily create a montage of classroom happenings or special events! In addition, we have several activities for parents to complete that we keep for their child's first day of school. 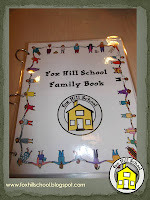 One of the activities that we do each year is to have parents make a family page for our Family Book. Parents are asked to bring a family photo with them to the Orientation. We provide paper, glue, markers, stickers and various sorts of other flat materials to decorate their pages with. 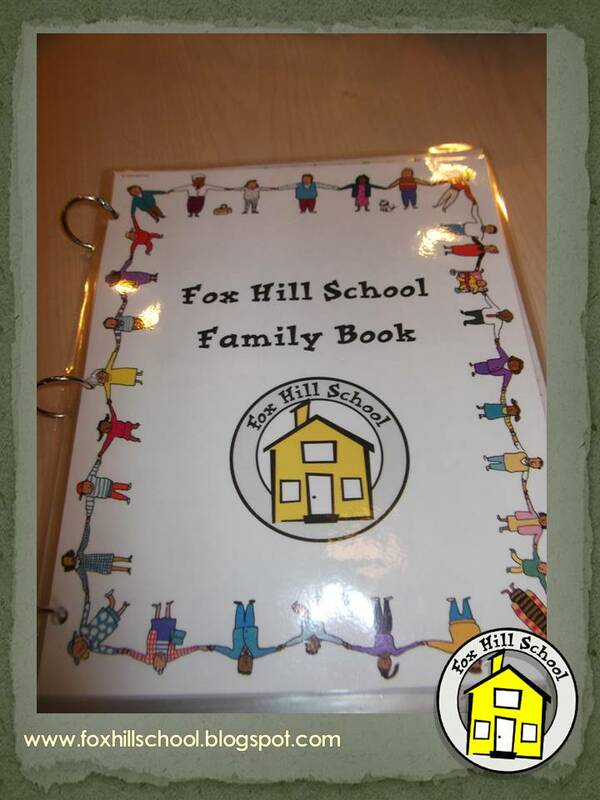 Parents then use the photos and materials to create a page about their family. We collect the families pages at the end of the night and over the summer we laminate each page and sort them by classroom. We bind the pages together into a book for each class that is then available on the first day of school and is kept on the bookshelf all year. 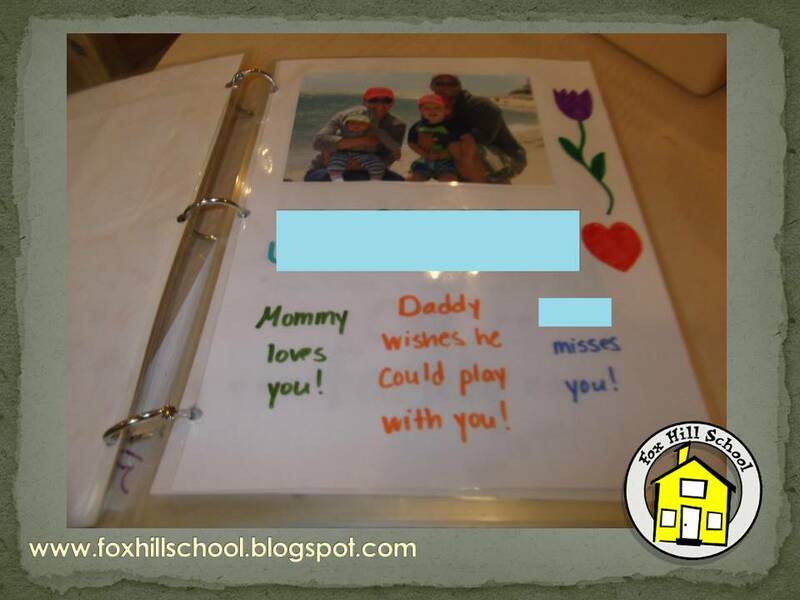 Children who may have difficulty separating from their parents during the first weeks of school love to go to the Family Book and see pictures of their family on a page that their parent made for them. These Family Books are a favorite book for the entire year! This year our first focus book will be LMNO Peas by Keith Baker. We love starting with this book because it touches on so many different topics to begin the year, the most obvious being the alphabet. The story depicts peas at work and play and having all sorts of careers. 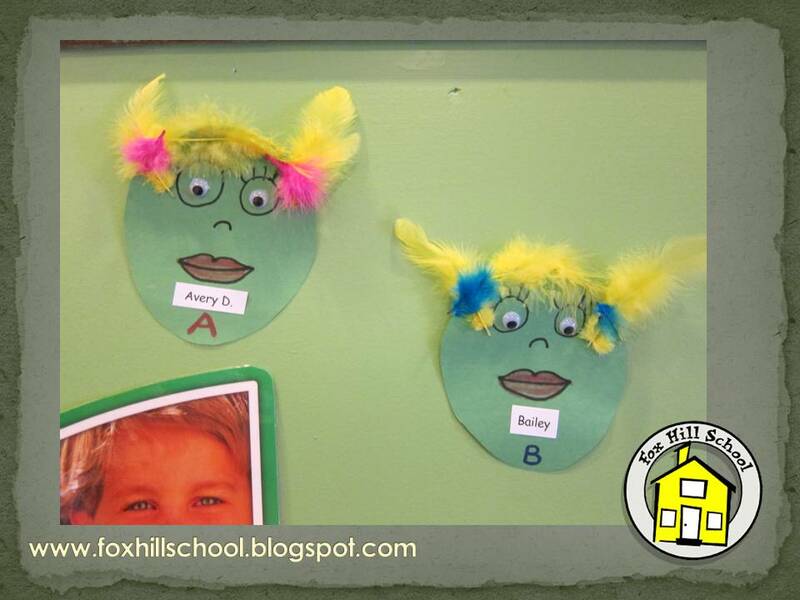 One of the activities we had at our last Parent Orientation was to have parents create "pea-ple" that resemble their children. 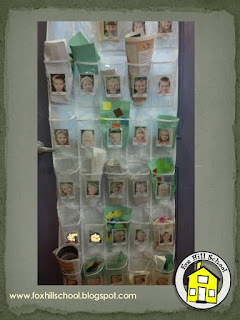 Then we use their pea-ple in classroom displays for the beginning of the year. This is a good ice breaking activity for parents and kids love coming in on the first day of school and trying to find the pea that their parents made that looks like them! When the kids start on the first day of school, they see evidence that their parents and families are a big part of their school. 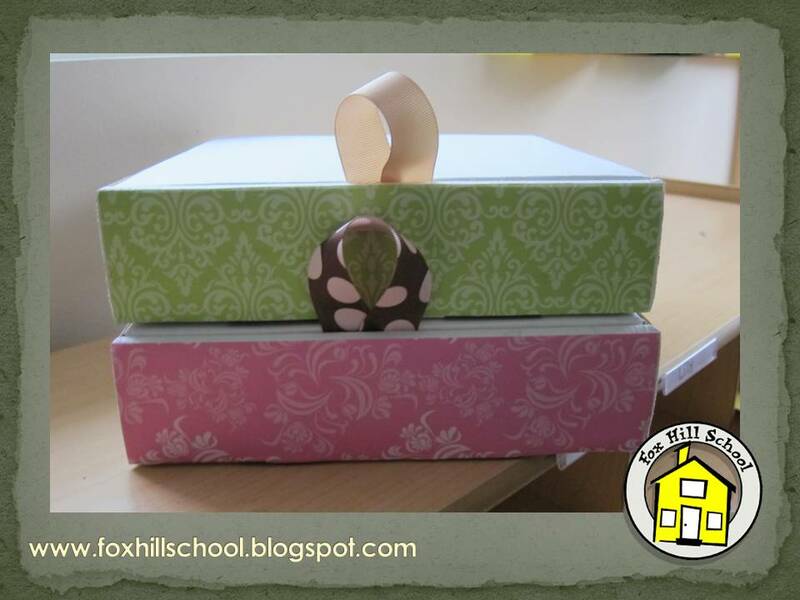 Parents know that their kids will have things in their classroom to remind their children how much they love them! These fun activities that parents do at orientation not only bring parents together but also give their children a great start to each new school year! The first day of school can be nerve-racking for everyone, kids, parents, even teachers! We try to do many things in advance of the first day of school that will make the children feel like they are a member of the school community, even on the first day of school. 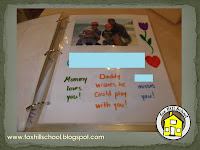 One of the things we do at both the preschool and the Kindergarten is have parents make a page for our "Family Book" at the Parent Orientation in the spring. The parents are asked to bring a photo of their family to the Orientation. One of the activities for the evening is for the parents to use the photo as the centerpiece to decorate a page of our Family Book. The page is just a standard sheet of copy paper and we provide them with markers, crayons, stickers and any other flat embellishments we can think of. Over the summer we laminate the pages made by the parents (thus why everything must be flat!) and bind them into books with metal rings, one for each classroom. When the children get to school on the first day, they see the Family Book on the book shelf prominently displayed. Each child can open the book and not only find a picture of themselves and their families, but know that their parents made the page for them. This especially comes in handy if a child is having difficulty separating from their parents. If the child really feels the need to have the page close to them, we can remove it from the rings and the child can carry it with them throughout the day so they always have their family with them! 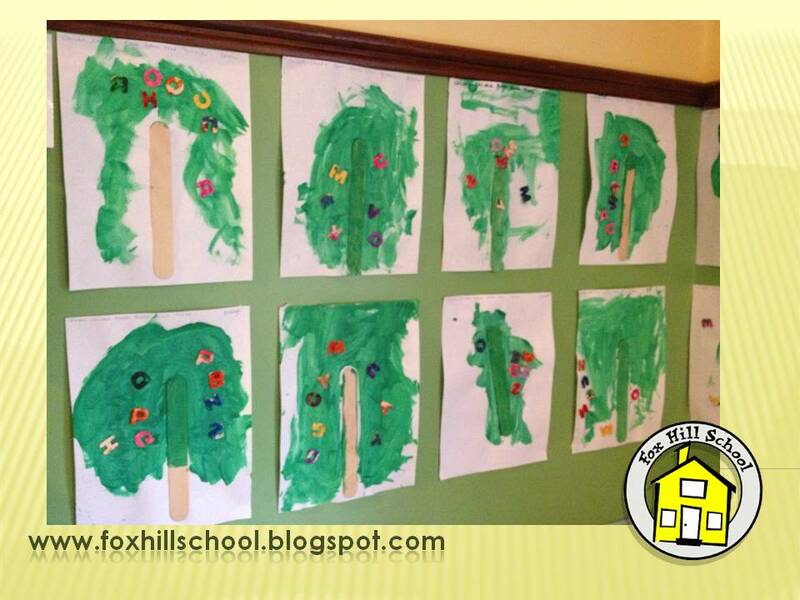 At the Kindergarten, we also have the children paint a picture of themselves at their orientation. Then over the summer we place the paintings in actual frames and use them to decorate the classroom. When they come to school on the first day, they see the paintings of themselves up on the wall and it builds a sense of belonging, even on the first day of school! 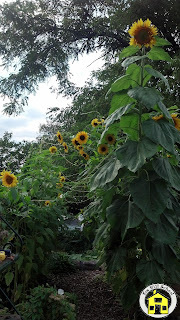 In addition to blogging, the another thing that I decided to learn about this summer was gardening. I don't have even one plant in my house and everyone knows I can't keep plants alive if my life depended on it! But last year the parents at the Fox Hill School Kindergarten designated and area for a children's garden aka the "Kinder-Garden." We had planted some pumpkins in the spring last year and they took over the entire garden with vines, but no pumpkins ever came. 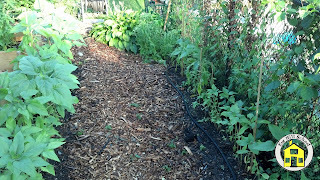 The vines were prickly to boot so the kids didn't really want to go in the garden very much. So this summer I redesigned the garden a bit, added a few garden boxes, and took a few pointers from a book called Roots Shoots Buckets and Boots by Sharon Lovejoy. This is a lovely book that even made me think I could overcome my black thumb. The part I am most excited for the kids to play in is the sunflower fort. 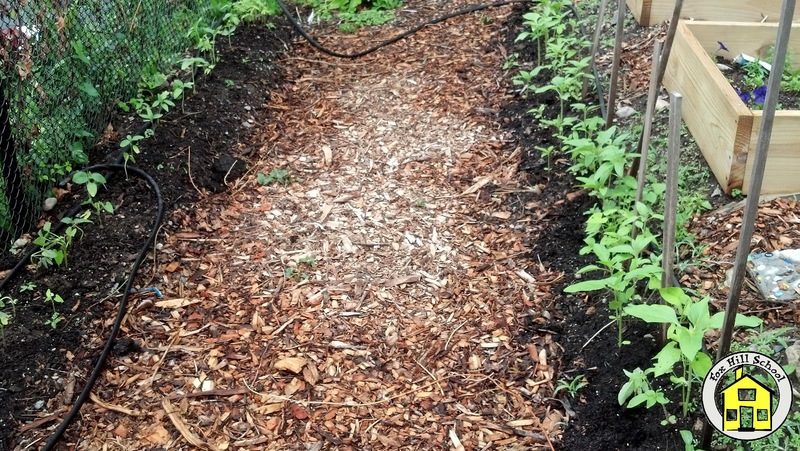 First, I laid down some newspaper and covered it with mulch. 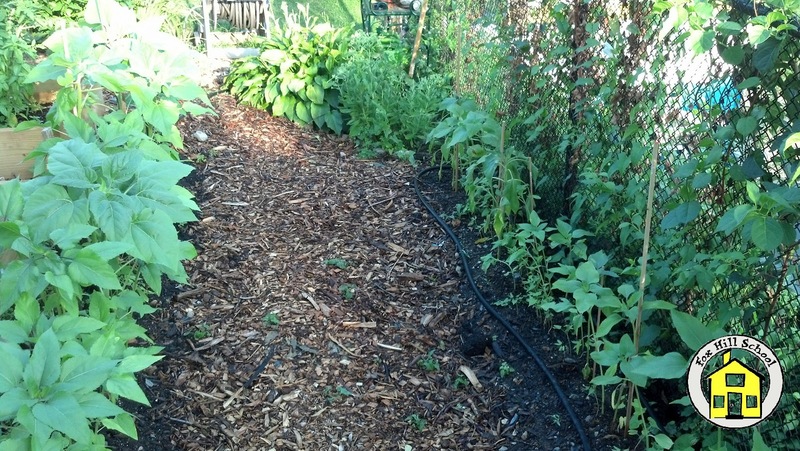 I saw this on Pinterest and it seems to be keeping the weeds at bay quite well. 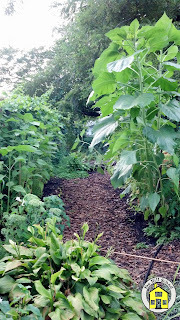 Then I planted various types of sunflowers and morning glories along the edge. After a few days of watering and sun, nothing happened so I planted some more seeds in hope that something would grow. Ta-da! Here come the sunflowers! Since our school kids have the summer off, I enlisted my own children to help me with the garden and give me a kids perspective about what the new Kindergartners would think is cool. Before my very eyes the sunflowers were growing! I almost wanted to stay away just so I wouldn't kill the plants by accident! The book says that the morning glories will grow up the sunflowers and if you tie string between the tops of the sunflowers, they will form a roof to the fort. 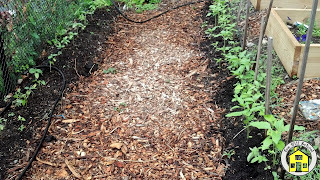 This part hasn't worked according to plan but the sunflowers on one side are growing much more quickly that the other side and they are bending over to kind of form their own roof so we are going to go with that! At the kids' orientation they made garden stones to place in the garden. 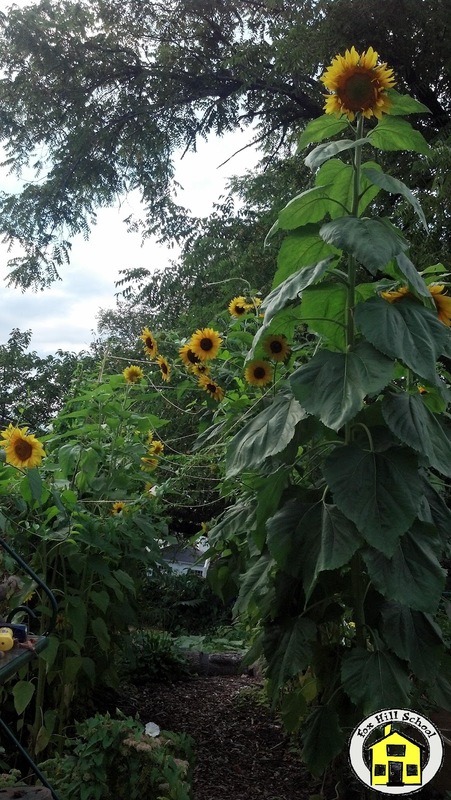 In addition to the sunflowers there are lots of tomatoes, cucumbers and herbs as well so in our Science lessons we will be able to kick off our year learning about plants and harvesting and then moving into the kitchen and using our home grown ingredients to make some snacks. 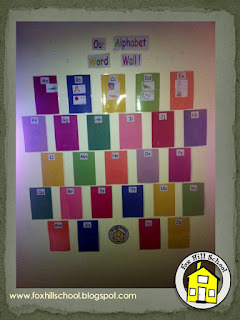 Alphabet word wall, A year long project! 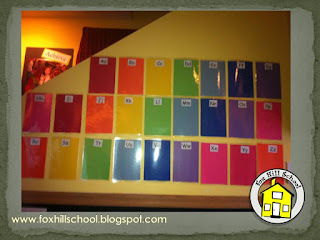 Last year I decided to make a DIY word wall using materials at school! During the school year we explore all the letters of the alphabet. The students learn how to write them, recognize their sounds, and discuss words beginning with each letter. 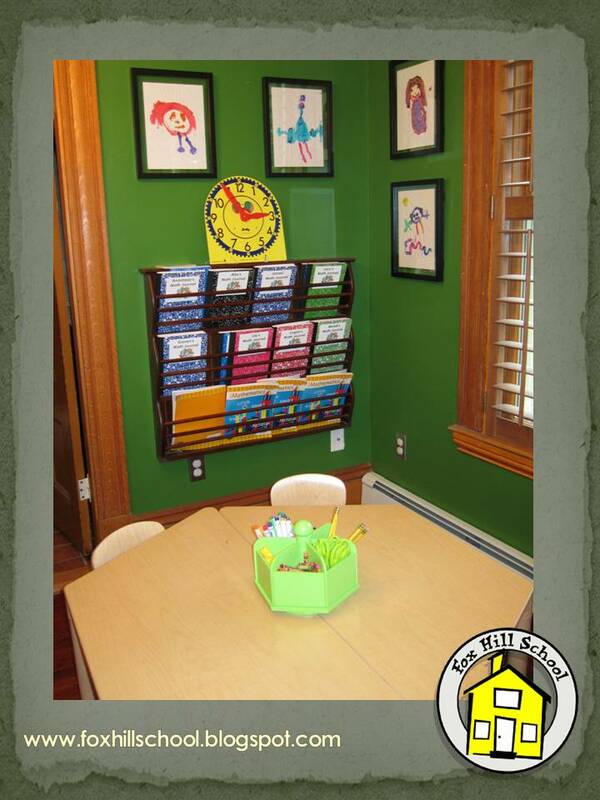 With each letter having a designated spot, pictures are printed for each letter to display all year long. I personally chose pictures based on long/short or hard/soft letter sounds ( if it applies) to show differences. Try printing individual pictures of the children in the classroom to use when their first letter matches! This becomes a personalized learning tool, visual aide, and a collaborative effort throughout the year. Not to mention it is a fool proof way for the educator to make sure every letter is discussed in class! 1. If you plan to reuse and recycle materials, try laminating. 2. Use a font that is clear to read and shows proper letter formation. Fostering Friendship with the Friendship Jar! 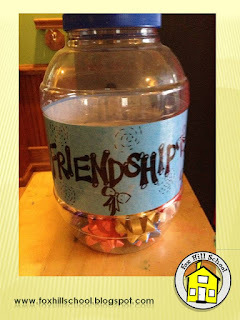 One way we reward sharing and caring at our preschool is with the Friendship Jar. As children are "caught being good," teachers will invite them to place a bow in our Friendship Jar. Our jars are usually recycled containers of pretzels from a wholesale club. The bows are everyday gift bows. It's so simple, but so very exciting for the children! When the children fill the jar through acts of kindness and responsibility in the classroom we have a Pajama Pizza Party! Of course we remind them each week at group time, and they are so excited about the future party it really motivates choosing kindness and taking care of our classroom materials. If a child needs help with something and a classmate assists without prompting. When someone is sad and we see a friend comforting them. A child notices classroom materials left out by others and quietly put them away without a teacher asking. If we hear children encouraging each other to try something outside of their comfort zone and then congratulating them after attempting the task! You can choose whatever behavior you'd like reinforced in the room. If most children are running to line up and you want to encourage walking, have the first child who walks to line up put a bow in the jar. You'll be amazed at how the rewarded behavior is quickly imitated by everyone else! If children are asking to put a bow in the jar, gently remind them that they need to be "caught" in the act! It takes a couple of weeks for them to realize you won't get a bow by asking. This helps the children strive to make best choices throughout the day......they want to be caught! If you try this in your room let us know the results! As Ms. Melanie mentioned in an earlier post, we paint the doors in our classrooms to designate whether a child is allowed to open it or not. Doors leading out of the classroom and out of the building are painted purple. Any doors(mostly bathroom doors) children may open are painted blue. You might ask, "Why not red for doors forbidden to open? Red means stop, doesn't it?" We feel that red does not complement the rest of the color scheme in our building, and would be aesthetically unpleasing. So purple & blue it is! "Isn’t it difficult to distinguish between blue& purple for some young children?" Barring any medical issues, those who don’t know what purple & blue are catch on quickly! The first week or two we drill the children on the colors purple and blue. One of our group activities might be pulling different objects (blocks, markers, crayons, paint cup lids and more) of purple or blue from the mystery bag and having the children shout out if it's purple or blue. We follow up their color identification with "Can you open a door this color?" After a week or two of these color drills even our youngest learners are able to own the rules of purple doors-no and blue doors-yes! When we break out into our activity time for that first week it's mostly about purple and blue, sort the purple and blue gift bows, paint with blue, paint with purple....the possibilities are endless! 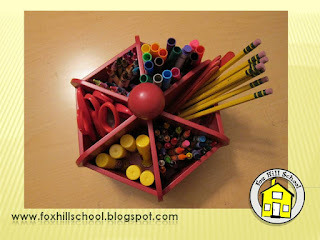 Although it’s ideal to have everything within a child’s grasp be something they can choose to use, this isn't always a luxury teachers have depending on the size and layout of your space. You can incorporate a similar system in your room to designate cabinets, bins, bookshelves or materials as “teacher only” by selecting a color and assigning it as the “stop” color. 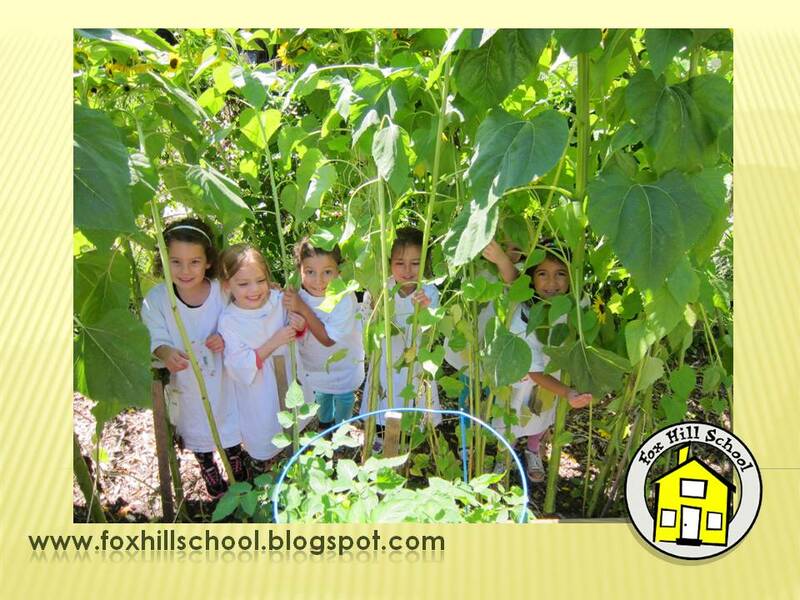 The New Fox Hill School Kindergarten!